When Susan & Tom Palomaki started Lucas Greenhouses in 2005, they didn’t want to be tied to routine spray schedules. So they hired Debbie Palumbo-Sanders to help them find a better, gentler way to cope with pests. 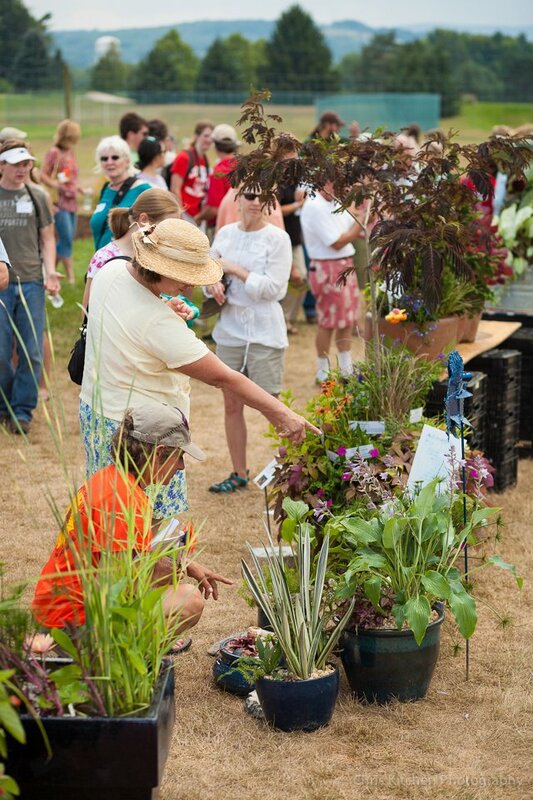 We caught up with Susan and Debbie at the 2012 Cornell Floriculture Field day after they accepted their Excellence in IPM award from the New York State IPM program. 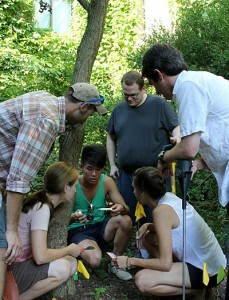 Master of Arts in Teaching students test soil pH as they explore ways to use nature as their classroom to teach science. From left, Josh Davendonis, Marita Wilson, Tony Leong, Jason Rush, Kit Stone, and Bryan Duff, lecturer in the Cornell Teacher Education program. With help from a nearly $300,000 grant from the National Science Foundation (NSF), the Cornell Teacher Education (CTE) program will transform how it prepares new teachers to educate the next generation of scientists — and citizens. “To inspire budding scientists and to ensure scientific literacy for everyone, we need teachers who see science everywhere — who can see the world in a blade of grass, to paraphrase Blake and Whitman,” says Bryan Duff, lecturer in the CTE program, which offers teacher certification in the sciences, a Master of Arts in Teaching and an undergraduate minor. CTE is taking a back-to-nature approach to science education that builds on traditions dating back to the Nature Study Movement, pioneered in part by Liberty Hyde Bailey and Anna Botsford Comstock at Cornell in the mid-19th century. Taking science outdoors increases student engagement and helps them understand the messy nature of science in the real world and appreciate the power of interdisciplinary approaches, Duff adds. 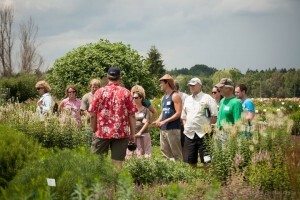 The capacity-building grant from the NSF’s Robert Noyce Teacher Scholarship Program will help CTE work with university scientists, informal science educators, outdoor educators, secondary science teachers and others to develop new curricula and redesign courses to help teachers in training learn how to use nature as their classroom. It also will support internships and summer teaching opportunities at rural and urban secondary schools to help them put what they’ve learned into practice. “We’re committed to making this approach work for all students, including those in cities where access to nature may be limited and those with disabilities that may challenge their access and success,” says Duff. This has led to collaborations with the ILR School’s Employment and Disability Institute and other experts to help overcome accessibility barriers. The Cornell Laboratory of Ornithology and the Paleontological Research Institution will work with CTE students to develop their public education skills in informal settings. Incoming freshmen can experience the nature study approach on a new Cornell Outdoor Education expedition, then share their new scientific skills by teaching them to local youth. An awards program will recognize undergraduates for their teaching excellence in many roles across campus, from teaching assistants to tutors to Public Service Center program participants. Associate Professor Cole Gilbert, Department of Entomology, is the grant’s principal investigator. Other investigators are Linda Rayor (entomology), Robert Ross (Paleontological Research Institution), Travis Park and Jeff Perry (CTE), and Nancy Hinkley (ILR School, Employment and Disability Institute). Find more information about CTE at education.cornell.edu. 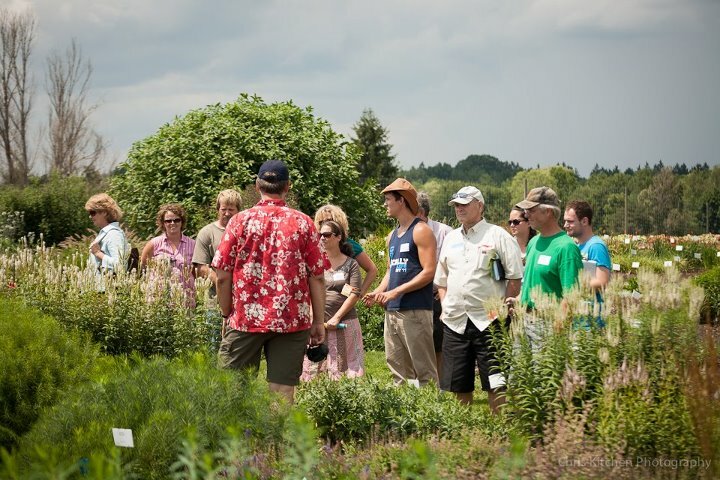 Whether you are a seasoned, new, or aspiring farmer, there’s something for you in the 2012-2013 line-up of online courses presented by the Cornell Small Farms Program and Cornell Cooperative Extension. The Department of Horticulture Fall 2012 seminar series (HORT 4950/6000) will kick off August 27. Seminars meet most Mondays, 12:20 to 1:10 p.m. in Plant Science Room 404 and via Polycom to Geneva A134 Barton Hall (unless otherwise noted). Everyone is welcome and refreshments are served. Videos of some past seminars are available online. Improving the abiotic stress tolerance of floriculture crops – why, how, and who cares? 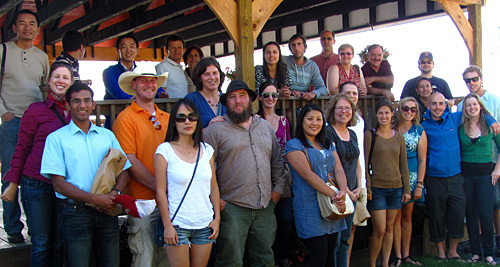 The SoHo graduate student club had our second annual winery tour last Saturday. We started with about 34 people — a good mix of new and old students, faculty and staff. 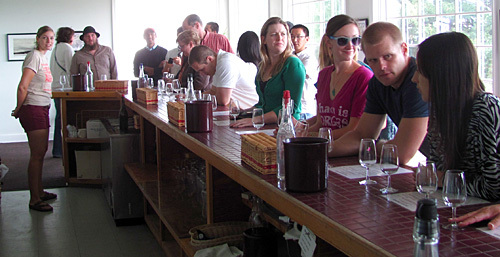 We visited: Anthony Road Wine Company, Fox Run Vineyards (where we had a vineyard and cellar tour), Glenora Wine Cellars, Hazlitt 1852 Vineyards, and the Finger Lakes Distilling. The tour finished up at Finger Lakes Distilling. Behind Glenora, we had a lovely home-cooked lunch that Katie King (social chair of SoHo) prepared for us. Over all a great success, and we hope to continue the tradition next year. 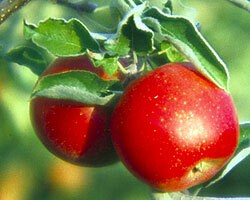 We’ve harvested the first apples of the season at Cornell Orchards! For the month of August, our retail store will be open every Thursday and Friday, 10 a.m. to 4 p.m. See website for latest info. We are looking forward seeing you at our store. Rt. 366 (709 Dryden Rd.) across from the Vet School. View Google map. 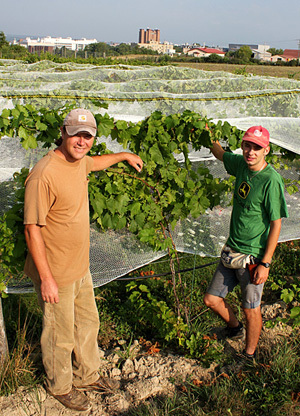 A block of about 500 grapevines at Cornell Orchards — a little more than half an acre — is now certified organic by the NOFA-NY Certified Organic, LLC. Berry specialist Marvin Pritts shows how blueberry, strawberry and bramble growers can use leaf tissue testing to be sure their plants are getting the nutrients they need. 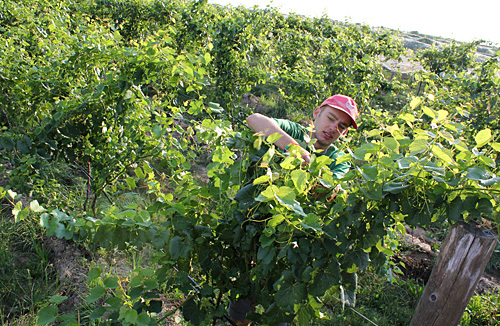 He demonstrates which leaves to sample and provides other sampling tips. From Agricultural Sciences major Missy Call, who is interning with the Department of Horticulture’s Annual Flower Trial Research at Bluegrass Lane. Cross-posted from the AgSci Interns blog. 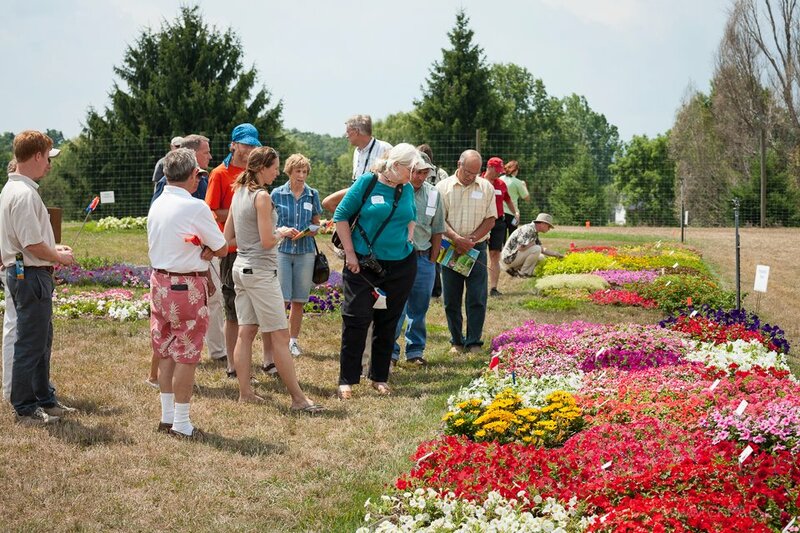 On Monday July 23, my team of interns and I had a big preparation day for the ninth annual Cornell Floriculture Field Day on Tuesday, July 24. The conference began with presentations followed by lunch and tours of Bluegrass Lane. Horticulture professor Bill Miller is pictured left leading a tour at Bluegrass Lane in his festive Hawaiian t-shirt. 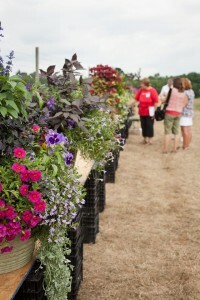 Over 130 horticulture professionals attended the event, which included a container competition. 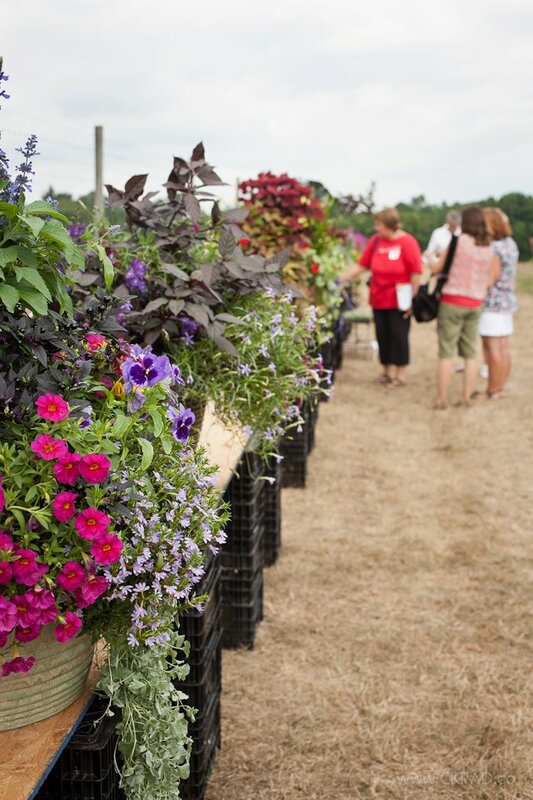 The competition is a main event that benefits IBD research in honor of Kathy Pufahl, who has inspired the horticultural business. Categories included Open Division, 16 inch pots, 12 inch hanging baskets, and Home Gardener Division. There were many exciting entries that I could see took time and care to create. Attendees were also asked to put 3 flags next to their favorite perennial flowers as well as 3 flags next to their favorite annual flowers. When we tallied up the votes, it came as a surprise that a variety of Caladiums were voted most favorite annual flower, since up until Field Day, they were not growing too well. We believe this is because they are a shade plant that was grown in full sun (which also may have been why they were chosen to win!). U.S. women’s eight team celebrates gold medal and London Olympics. AP photo. Caryn Davies, daughter of professor Peter Davies (Plant Biology, Horticulture), took home her second gold in as many Olympics in women’s crew on Thursday as the No. 2 seat in the U.S. women’s eight boat, when the Americans bested second-place Canada by more than a second. Davies also won silver at the Athens Olympics in 2004. See Ithaca Journal article for details: Ithacan Davies, Ithaca College grad Musnicki strike gold.